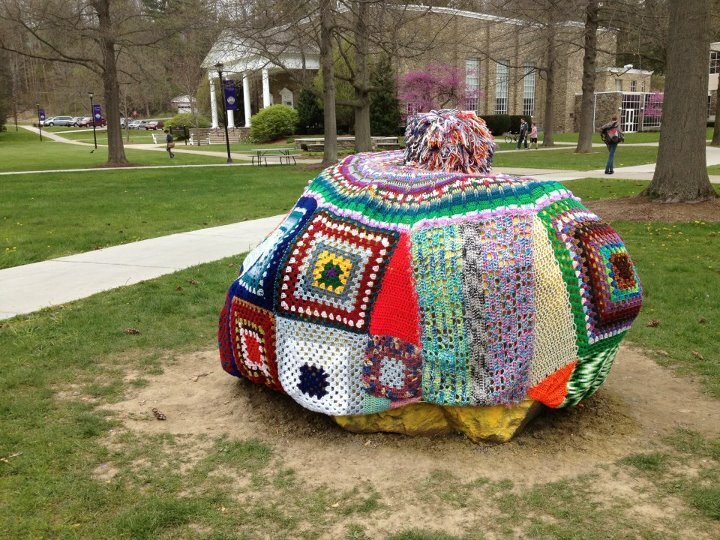 Little Lovely Stuff: More yarnbombing! I just love this! When the post said that someone had made a cosy for a rock, I was picturing a little, doorstop kind of rock. Oh no. This is much more ambitious. Its at Houghton College, somewhere in the US. I'm Ali, living in the West Midlands in the UK with my husband and two mad cats. I'm a musician, reader, writer and obsessive crocheter. I have a Folksy shop, also called Little Lovely Stuff, where a lot of the things I make are for sale - click on the link below to go there - and I'm happy to take commissions and orders - just leave a comment! Little Lovely Stuff on Folksy / @AliB138 on Twitter. Hola amigas nuevo chal y muy feliz!! !